Precious metals futures advanced as a group for a second day in a row Wednesday. Gold extended its winning streak to five straight sessions and, like for silver, ended at a fresh four-week low. Gold for February delivery climbed $3.90, or 0.3%, to settle at $1,291.40 an ounce on the Comex division of the New York Mercantile Exchange. The settlement was the highest since Nov. 28 when prices finished at $1,294.90 an ounce. "The precious metals bulls have technical momentum amid fledgling price uptrends on the daily charts, which are drawing in more chart-based buyers," Jim Wyckoff, a senior analyst at Kitco Metals Inc., said in a daily report. "It has been a quieter trading and news week so far, as many traders and investors are out during the holiday season. This is allowing technical considerations to have more daily influence on gold and silver prices," Wyckoff added. Gold futures ranged from a low of $1,286 to a high of $1,292.20. They rose 0.7% in their start to the holiday-shortened trading week on Tuesday. 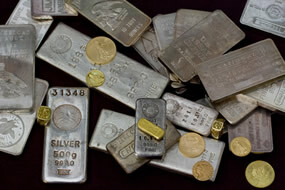 Elsewhere, silver for March delivery advanced 15.2 cents, or 0.9%, to close at $16.756 an ounce. The settlement was also the highest since Nov. 28, when prices ended at $16.822 an ounce. Silver futures traded between $16.55 and $16.79. They moved up 1% on Tuesday. April platinum edged up 50 cents, or less than 0.1%, to $928 an ounce, ranging from $925.50 to $932.20. Palladium for March delivery gained $13.90, or 1.3%, to $1,056.35 an ounce, trading between $1,043.95 and $1,061. The close is the strongest since February 2001. Gold added $11.35, or 0.9%, to $1,279.40 an ounce. Silver added 32.5 cents, or 2%, to $16.50 an ounce. United States Mint bullion sales were unchanged as of 2:22 p.m. ET. Below is a sales breakdown of U.S. bullion products with columns listing the number of coins sold during varying periods. Products with an asterisk (*) are no longer available.